William Neill was born to William and Jane Snodgrass Neill in McKeesport, Pennsylvania in April 1778 or 1779, though the exact date is unknown. While William was still an infant, his father was killed by a band of Indians, and soon thereafter his mother died as well. After her death, William and his five siblings were scattered among relatives. Neill moved to Canonsburg, Pennsylvania where he attended country schools and later became a clerk in a country store. In 1797 he entered the Canonsburg Academy with the intention of becoming a Presbyterian minister. He later enrolled at Princeton University, graduating in 1803. He immediately took a job as a tutor at Princeton, and on October 5, 1805 he married his first wife, Elizabeth Van Dyke, with whom he had two children. In that same year, Neill became a pastor in Cooperstown, New York, and while there he tutored James Fenimore Cooper and his brother Samuel. He later took positions in Albany and Philadelphia. In 1809 Elizabeth died, and on February 25, 1811 he married Frances King. In 1824, William Neill was chosen president of Dickinson College. During his time as president, Neill tried, unsuccessfully, to secure the association of a theological seminary with the college. Enrollment at the college did increase during his tenure in any case. As president, he was known for being a good administrator and a strict disciplinarian. In 1829, Neill resigned from the presidency, taking with him a large portion of his faculty. The reasons for these departures are not fully known, but differences between the faculty and trustees regarding the governance of the college and its students were likely the cause. 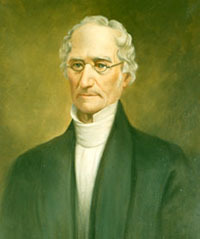 Neill then became the secretary of the Board of Education of the Presbyterian Church, a position he held until 1831. His wife Frances, mother to three of his children, died in 1832, but he would remarry again on April 15, 1835. This union to Sarah Elmer would bring Neill two more children. Little else is known about William Neill but that he passed away on August 8, 1860.